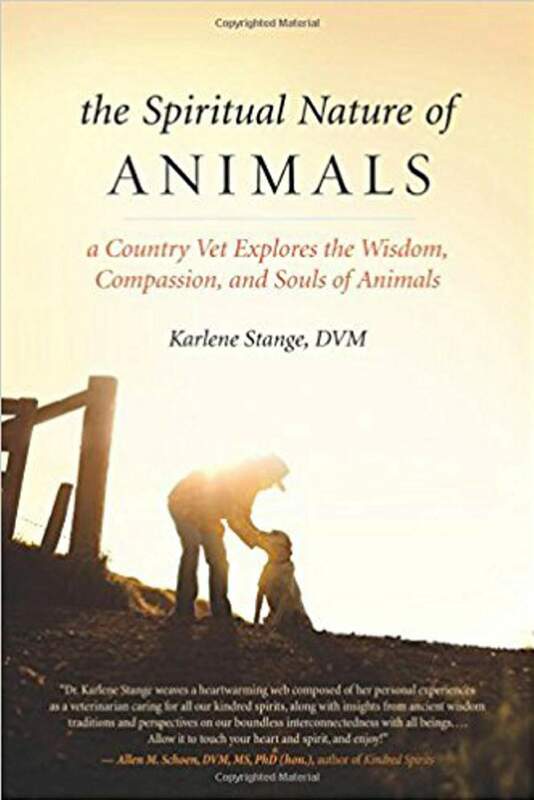 The Spiritual Nature of Animals by Dr. Karlene Stange, a longtime La Plata County veterinarian, has written a heavily and lovingly researched book about humans’ best friends. During her 30-year practice of caring for animals, and by extension, their owners, one of the most difficult tasks was euthanizing animals. Questions about what happened to the animal afterwards, according to the owners, ranged from the animal had no soul, to of course they do, and now they will go on to heaven, another life form or existence. This led Stange to wonder how to help her patients and their owners face this moment and what did other cultures and religions believe about animals and their status as living beings. Her motivation was always how best to help her clients. Thus began an extensive quest for information and answers. Stange began by exploring the different origin stories of Native Americans, Africans, Aborigines and ancient Hebrews. She also researched hunter gatherers, Mother Nature and shamans. She included the major religions including Hinduism, Buddhism, Islam, Judaism and Christianity. She researched scientific evidence and expanded her search into mystics, clairvoyants and animal communicators. What she discovered, she shares in this well-written and heart-felt book. A: Veterinary medicine can be exhausting physically, demanding mentally and disturbing emotionally. Large-animal doctors work long hours, outside normal business hours, in bad weather, for low pay. After 15 years as an ambulatory horse doctor, I needed a diversion to prevent spontaneous combustion from burn out. At the same time, my clients expressed a wide variety of opinions about what happened to an animal after death. A Buddhist client believed her dog would reincarnate, and she also had taken a vow to not kill. The dog was at its end, and she wanted me to help it die without euthanasia. In contrast, a Baptist client asked me to perform euthanasia for her old horse and believed the horse did not have a soul or go to heaven. These two women made me wonder what is true about the spiritual nature of animals. I also had heard things that made no sense to me, such as animals do not feel love and animals are not conscious. I became obsessed on my quest to explore the world’s religious, scientific and spiritual teachings about the immaterial aspect of creatures great and small. This journey changed my life. Q: How long did it take to research and write this book? A: I spent over 20 years gathering research, learning to write and getting the book published. I worked as a mobile veterinarian the entire time, driving a pickup truck around La Plata, Montezuma and Archuleta Counties. Much of the research was done by listening to audio books on cassette tapes while I drove over 100 miles a day. Religion is a touchy topic. I wanted to be respectful of each and present an authentic representation for every belief, rather than my opinion. I studied each teaching until I understood it. I interviewed countless experts and discussed my book with everyone I met. I took writing courses, went on a vision quest, attended retreats with a Tibetan Lama and others with Buddhist nuns and practitioners; I prayed, meditated, took an animal-communication apprenticeship and interviewed every monk, nun, priest, preacher, rabbi, shaman and spiritual teacher I could find. The book also has many quotes from locals I questioned, (although their names are changed); numerous local folks gave me suggestions about books to read or they gave me tapes to listen to. .
Q: What advice would you give people when they face the loss of their beloved pets? A: Read this book. The information builds upon itself from one chapter to the next, until the final describes the three types of death: gentle passing away on one’s own, assisted by humans and traumatic. In each case, lessons come up including do not listen to your friends and neighbors who are all too happy to share their opinions about what you should do. They change their tunes when their own animals die. Listen to your inner guidance and discuss things with the animal as well. Give them permission to go. Thank them for their friendship, apologize for anything you may have done to hurt them and forgive them for any past transgressions, until you feel no regrets. Try to remain calm: Death is a very special time in your relationship. Like birth, there is pain, but it is also a rich experience to share with a loved one. At any time during or after the death, visualize the animal as healed in every way – physically, emotionally, mentally. Then see your friends fly off as they become pure light, dissolving into Pure Light. This visualization is helpful even years after a death. You can still talk to your friend because love never ends. That shared spirit is eternal. More information: Visit http://bit.ly/2COakT5 or call 884-2222. Copies of the book are available at Maria’s Bookshop, 960 Main Ave.